We Supply the machinery & drainage system for food processing, pharmaceutical industries as well as commercial kitchen & restaurants & supermarket. 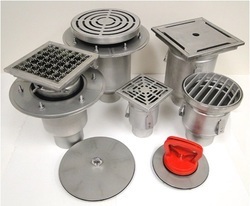 Types of Floor Drains : Heavy Duty with Vertical Outlet, Heavy Duty with Horizontal Outlet, Mini with Vertical Outlet, Mini with Horizontal Outlet, Single part & Two part Drain. Square & Round shape top. Fitment: It slips snugly into the drainage pipe and is easy to install. Drainers can fit various pipes. Different type of interfaces between pipe and drainers are also available. All standard outlet sizes are available. Designs & Description of Floor Drain : Gratings are available in various shapes, dimensions and finishing versions. Waste Basket recommended when the drained waste water has a high content of solids. Traps are very functional & easy to maintain, ensures easy access to the sewer, quick cleaning and offers a possibility of checking of locks. Flanges used when it is necessary to drain water from horizontal sytems installed under the floor. Selection of appropriate Floor Drain : The appropriate floor drains are selected on two basic parameters 1. Amount of drained waste water. 2. The load value, type and intensity i.e. load bearing component is the grating, which can withstand a given load depending on its type and height. Standard channels are made of stainless steel, are used to drain water from floor and discharge it to the sewerage. This type of drainage finds application in food processing plants, breweries, dairy plants, slaughter house, chemical plants, restaurants, hospitals & similar places. They are also used in facilities, where the sanitary regulations and technological process necessitate making the stainless steel drainage , due to high hygienic requirement. Sizes: Sizes available from150 mm width Channel…Special sizes can be made as per your requirement. Fitment: Standard channel sections are joined by means of flanges with gasket. Designs: The standard channels have in-built inclination to facilitate installation, each channel is equipped with leveling bolts and anchoring elements for correct height adjustment and placement in concrete. Depending upon customer preference, the standard channels can be connected with other drainage component, such as floor drains & Slot channels.